Young black bears will climb trees if they feel threatened. Bears turn up in urban and suburban areas throughout New York State every year. During spring and early summer, young males set out on their own and sometimes travel into cities and towns where bird feed, garbage and pet food are available. When this happens, DEC’s first response is to monitor the bear’s movements, collaborate with local police and ensure the bear can find its own way safely out of town. Yet, when a bear seeks refuge in a tree and crowds form, the situation becomes more difficult. If a safe escape route exists and the crowd leaves, the bear might wait until dark and then return to its natural habitat. If there is no escape route or curious onlookers remain, DEC may tranquilize and relocate the bear. However, the best scenario is for the bear to find its own way back out of town. 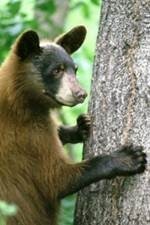 Learn more about how to prevent conflicts with bears by visiting DEC’s Nuisance Black Bears (http://www.dec.ny.gov/animals/6995.html) webpage.